The pork chops should be about 1 1/2" thick. Don't crowd them in the pan for roasting - use a roasting pan if skillet is not large enough. The sauce is outstanding. For the best flavour, use homemade or purchase low sodium stocks. 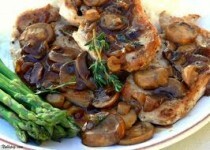 Excellent plattered with a mound of creamy, garlic mash potatoes with fresh asparagus on the side. 2) Sprinkle chops with salt, pepper and 2 tsp. rosemary. 3) Heat oil in large skillet over medium heat. Working in batches, sear 2 minutes each side. Remove and set aside. 4) Add mushrooms to skillet with more oil if needed. Saute' until soft, about 3 minutes. Sprinkle with remaining rosemary and place chops on top. Place in oven and roast 45 minutes, turning once, or until chops are cooked and slightly pink in the centre. Remove chops and mushrooms from pan. 5) Place skillet on medium-high heat. Add wine and vinegar. Bring to a boil scraping up browned bits from bottom of skillet. Add stock and tomato paste and boil until mixture become slightly syrupy, about 5 minutes. Whirl in the Horseradish Garlic Condiment until blended. Remove from heat and beat in butter. Stir in mushrooms and chervil. 6) Place pork chops on plate stacked with garlic mashed potatoes. Top with mushrooms and drizzle with sauce.